Have you ever wanted to snap a photo but the moment was already over before you logged into your phone and opened the camera app? You can avoid these two steps by simply clicking the home button twice to go straight to the camera. Who knew it could be so easy? ‘Hope this helps you catch a few more great photos during the holiday season! Please join your neighbors to support Kelley Payne, an EMT with the Arundel Volunteer Fire Department. She is a 21–year old single mom who recently graduated from Anne Arundel Community College with a paramedic certificate. Two weeks ago, while moonlighting as a server at Blue Dolphin restaurant in Crofton, Kelley suffered a stroke, which resulted in right side deficit. She can’t work, but her rent and other expenses must still be paid, as she undergoes extensive therapy. On Tuesday night, July 19th, from 6:30 PM until 10:30 PM, a benefit will be held at the Blue Dolphin for Kelley, with food, beer, a DJ, silent auction, and 50-50 raffle. The event will be hosted by Craig Laughlin and Joe Beninati, announcers for the Washington Capitals. You can purchase tickets with cash or check at Mixed Elements Salon (410-878-2284) in the Crofton Princess Center near the Blue Dolphin, at $20 per person. Please be sure to stop by Mixed Elements to make a donation, even if you don’t plan to attend the benefit. If you want to wow your friends and relatives at a holiday party this year, don’t take a bottle of wine… take a homemade cheesecake. It’s a lot easier to make than you think, and it’s both festive-looking and totally yummy. Chill in refrigerator while you prepare the filling. With mixer at medium speed, beat softened cream cheese until smooth. At low speed, beat in eggs, sour cream, cornstarch, lemon juice and vanilla extract. Continue beating for 3 minutes, scraping bowl often. Bake 60 minutes or until lightly brown. Turn off oven, and let cheesecake remain in oven 30 minutes with door closed. Remove from oven, cool pan on wire rack, cover and refrigerate (still in pan) for 1–3 days. Immediately prior to serving, use spatula to separate crust from side of pan, and remove the side of pan. With large spatula, loosen cake from pan bottom, and slide cake onto a dessert platter. Spoon topping evenly on top of cheesecake. My husband’s blueberry pies are a favorite at family gatherings, but this Christmas I’m taking cheesecake with cherry topping, just like you see in this photo. I suspect the inlaws and cousins will soon forget all about that blueberry pie after they experience this homemade cheesecake! Out of Town Guests for Thanksgiving? If you’re entertaining out-of-town visitors to Crofton for Thanksgiving, what are you planning for them on Friday, Saturday, and Sunday? Why not drop them off at New Carrollton Metro so they can get downtown on their own to explore our Nation’s Capitol? If you’re not a frequent Metro commuter, you may not be familiar with the Interactive Metro Map available online now. Just click on the right tab (see arrow below) and enter any address to find out what Metro station is nearby. With a few minutes advance planning, your out-of-town guests will be able to plan their day-trip in advance. The next time you’re looking for an excuse to take a break from Thanksgiving preparations, sit down for a minute and click on the map below to access the interactive map on the Metro website, and give it a try. Posted by Margaret Woda | Discussion: Comments Off on Out of Town Guests for Thanksgiving? Ray Farrell was the son of a widowed Irish immigrant who came to the United States to escape the potato famine in Ireland. The armistice ending World War I might not have been signed at the Palace d’Versaille on November 11, 1918, if it were not for him and the men he led. Their role was less prominent than that of the top negotiators, but it was significant in securing the peace. French Prime Minister Georges Clemenceau wanted to cripple Germany economically, politically and militarily so they could never invade France again. Britain’s Prime Minister David Lloyd George supported reparations, but to a lesser extent than the French, and sought compensation for the many widows, orphans and men crippled during the war and unable to work. Ray Farrell was the Chief Clerk of the Supreme Allied War Council, a shorthand reporter himself, in charge of all the shorthand reporters who created a record of the proceedings for participating nations (and history). In 1918, there were no audio recording devices, so every session was painstakingly recorded with pencil in shorthand notes, and later transcribed and reconciled by those shorthand reporters. 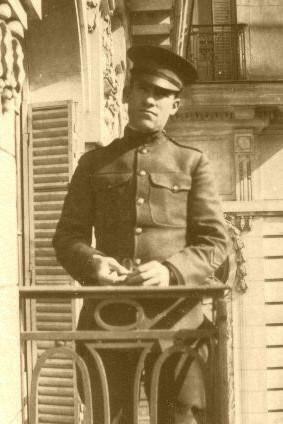 When a final product finally evolved, calling for fighting to end on the eleventh hour of the eleventh day of the eleventh month, Ray Farrell devised a plan for securely communicating the armistice back home to the United States for Congressional approval. He divided the document into several small sections and transmitted each separately by telegraph. In the end, Congress did not ratify the Treaty because of their objections to forming a League of Nations, but they did approve the armistice which ended fighting on November 11. On the first anniversary of the armistice ending World War I, President Woodrow Wilson issued a proclamation expressing pride in the heroism of those who had fought during the war. All business stopped and two minutes of silence was observed, beginning at 11 am. Several states made Armistice Day a state holiday in the 1920’s and 30’s, and Congress declared it a federal holiday in 1938. Then, in 1954, the name of the holiday was changed to Veterans Day to honor those who served in World War II and Korea. Today, all veterans are honored on November 11.